Hyperlite Mountain Gear has Fixed their Hip Belt Pockets! Looks like HMG has fixed their Hip Belt Pockets on their 2400, 3400, and 4400 packets! So they finally fixed the Hip Belt Pocket. The old one personally didn't upset me too much. You can see in my review that I was content with the old hip belt pockets. But I am not upset by this new and thing the bigger pockets will be awesome and I totally do wish they were on my HMG 4400. 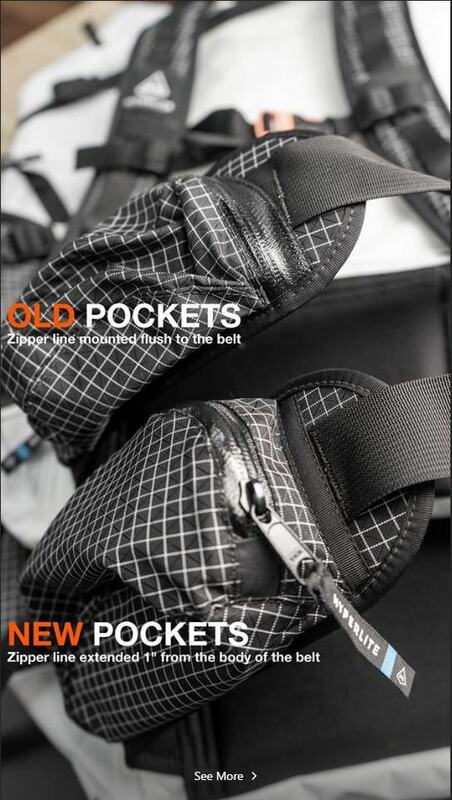 Unfortunately other than telling us they updated their new pockets, the video on the HMG site focuses more on their employees reading reviews of their old hip belt pockets. They do not actually show or tell us much about the new ones other than they are bigger and made them easier to access. They do indeed look bigger to me, and it looks like they fixed access to the hip belt pockets by moving the zipper a little. The old zipper was pretty much right on the hip belt, the new ones look a little off which should make them easier to access. I am looking forward to seeing the reviews once some hikers get these newly updated HMG packs. MikeJones Those look significantly bigger and a lot easier to open while the pack is on!